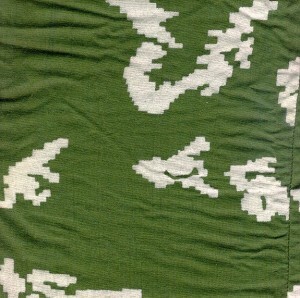 Главная Европа СССР Камуфляж Two-piece "computer pattern"
Расцветка: The camouflage pattern is the same as used in the reversible coverall from 1975 (sometimes referred to as "computer pattern"), but this uniform is not reversible. Дополнительная информация: There is a lot of small "tubes" for mounting branches for camouflage as well as a facial mask. The uniform is rather thin but is cleary made as a proper uniform and not a coverall worn over a "real uniform".